Join the first annual EIS TAPE CLUB and experience the joy of a fresh new cassette in your mailbox all year long. We'll be releasing a new tape every other month with some of our favorite new bands. Six brand new tapes. Re-discover the glory of discovering new music... all. year. long!! 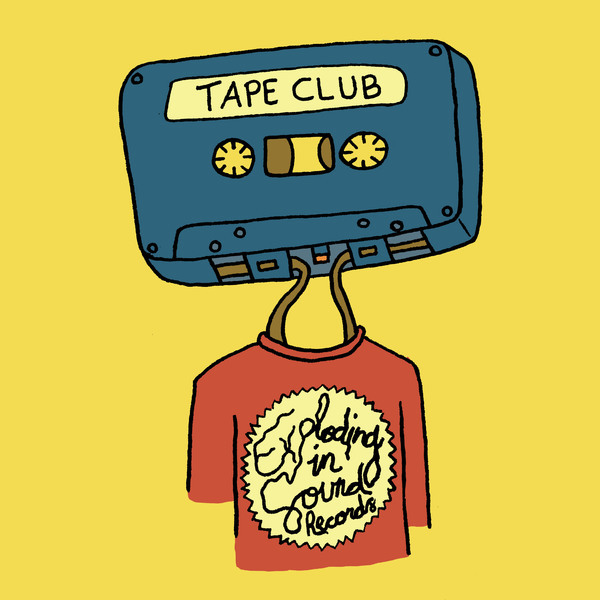 Inspired by the incredible amount of amazing new music we wish we could release, the EIS TAPE CLUB is a celebration of independent music, new artists, and the pursuit of finding your next favorite band. Starting on April 28th, we'll send you the first installment, with a new tape to follow every eight weeks (to the best of our ability). We're very thrilled to have Anna Altman kicking off the series with their full length debut Freightliner. All EIS TAPE CLUB subscriptions come with an exclusive EIS enamel pin and EIS TAPE CLUB stickers!! But wait!! There's more. In addition the "Standard Edition" membership, we will also have a limited "Extra Spicy Edition" a special extra-limited subscription that comes with everything in the "Standard Edition" PLUS three classic out-of-print EIS related releases and our very own EIS TAPE CLUB T-Shirt!! * Shipping is included in the cost for all US orders. For orders outside of the US, please email alec at explodinginsound dot com to arrange terms for shipment payments.